Property division and support agreements are part of many divorces. Divorce can cause serious financial burdens for ex-spouses. Filing for bankruptcy may help alleviate some of that debt. 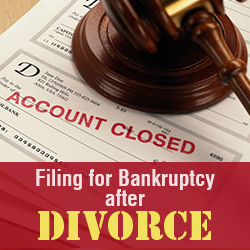 However, bankruptcy will not discharge financial obligations that you agreed to in your divorce degree. In Columbus, Ohio, family law attorneys know that spouses often threaten to file for bankruptcy. If you owe your ex-spouse past-due alimony or child support as part of your divorce decree, a Chapter 7 or a Chapter 13 bankruptcy won’t erase these debts. In fact, the bankruptcy court won’t grant you a Chapter 13 discharge, finalizing your case, if you still owe past-due child support or alimony. Your divorce decree might order you to make payments to your spouse in exchange for property. You can’t wipe these out if you file for Chapter 7 bankruptcy but, if you file for Chapter 13, you can usually roll them into your payment plan. With a Chapter 13 bankruptcy, you give your trustee your extra income each month, after you pay your necessary bills, and the trustee distributes this money among your creditors, including your ex-spouse. At the end of your Chapter 13 plan, if you still owe money to your ex-spouse, that portion of the debt is usually eliminated. If you have to pay certain debts as part of your divorce decree, you might think about filing for bankruptcy to wipe them out. Your creditors can’t come to you for payment if you file for bankruptcy after your divorce, but they can still look to your ex-spouse for payment of debts you signed for together. An ex-spouse who has to pay these debts even though the divorce court ordered you to do it can usually take you back to divorce court. Often, the court will order you to pay her back – or you’ll end up paying the debts anyway. When emotions are running high, you may find it difficult to restrain your words and think about the long-term consequences of your behavior in an adversarial divorce. Constructive divorces and separations do exist, and constructive divorces lead to better-adjusted children and families. While doing what you can to avoid divorce is an admiral first choice, sometimes a divorce is the only chance in hell you have for protecting yourself from complete disintegration. If the latter is your situation, take the necessary steps to a constructive divorce. Ask anyone who has been through a dramatic divorce, and they will surely tell you poor behavior wasn’t worth the pain they ultimately caused their family. The most well-adjusted children of divorce are those whose parents were reasonable. First, accept responsibility for regulating your behavior no matter what your spouse does. Try not to allow your emotions dictate your behavior, even if your controlling spouse cannot do the same. Easier said than done in many cases, but self-control can lead to a more constructive divorce and spare you much future grief. Separate your emotions from the decision making process. Try to remain as reasonable as you are in a safe environment, and don’t let your emotions control your actions. Separate your parenting responsibilities from the conflicts with your spouse. At all costs, protect your children from the conflicts you have with your soon-to-be ex-spouse. Accept your responsibility for your contribution to the problems that led to the divorce. Blaming your spouse will prevent you from learning and growing from your experience, and blaming will lead to nowhere but a destructive divorce. Try to understand your spouse’s viewpoint. As crazy as your spouse may seem at times, make an effort to see his/her perspective because doing so may improve your chances of getting what you want while diffusing both parties anger and resentment. Be willing to negotiate and compromise. You will not get everything you want, but your children’s future is more important than having everything your way. Make a commitment to an equitable settlement process. If you are dealing with a freak who demands total control, equity may be difficult to settle, but realize the courts are not going to see right through your spouse the way you hope. You will benefit more by spending your money on your children’s future than on litigation. The fastest way to destroy a child is through a messy court battle. Think about what is best for your children, and put your emotions aside – for their sake. A constructive divorce is your best choice when divorce is inevitable.